The excitement is still real, I must say! I’ve talked about some of the initial thoughts I’ve had about the new rules back when the previews were coming out from the community site, but I must say, when confronted with a book full of the blighters, it does make army building somewhat convoluted to try and make the most of it all. There are, of course, three distinct traits within the book, for Kabal, Cult and Coven. There are ten distinct “chapter tactics” on offer, each with their attendant warlord traits and stratagems, and trying to get everything to work the way that you want can be something of a nightmare, to say the least. One of the goofiest things that the new Codex gives us is the opportunity to gain a ridiculous amount of command points for fielding a ridiculous number of Patrol detachments – 1 HQ, 1 troop choice mandatory. The idea, of course, is to represent a number of different raiding parties joining together to invade realspace and get some slaves, and while part of me likes the idea of having a table full of troops to just spam, I’m not entirely sure it’s the way I want to build my army. Of course, it hasn’t stopped me from going with a trio of Patrols in my debut list from the Codex! This build gives me 11 command points, and I’ve been toying with the thought of scrapping it to get a Brigade going on for 12. But the way that the Obsessions work, it’s going to be really difficult to get an interesting and diverse list running. Which is one of the interesting things with this book – it gives us so much choice, but what kind of choice is it, really? If you want to get the benefit of command points to use on the plethora of stratagems (and there are some really interesting ones across four pages of the book), you’re almost forced into using the Raiding Force rule and getting multiple patrols. Which I suppose is fine, if you don’t mind only having a maximum of two elites, fast attack, etc. I’ve not given it a tremendous amount of thought yet, but I’m currently thinking it might do just as well to run two battalions, one for the kabal and one for the coven, either leaving the cult out of it totally, or perhaps using the outrider detachment for some reavers… Well, anyway! Obviously, I’m going for Kabal of the Obsidian Rose, as it’s the colour scheme I’ve been using since I started this army last year. The archon I built as Aestra Khromys is now technically illegal, as Archons can no longer take phantasm grenade launchers, but never mind! It’s her I plan to have riding around in a Venom with her Court as part of the Battalion. Obsidian Rose gets to add 6″ range to all Assault, Heavy and Rapid Fire weapons, which is so very handy for Drukhari, who want to keep everybody at range after all! For the Coven, I’m using Coven of Twelve, who gain +1 AP to all melee weapons. I’ve decided to go with the Alliance of Agony stratagem for a start, and give the Haemonculus from the spearhead detachment the Scarlet Epicurean warlord trait. I kind of want all of my haemonculi in melee, so giving him something that reduces damage dealt to him should be useful. The warlord of the actual army, Aestra up there, gets Deathly Perfectionist, which increases the damage dealt by her weapons. For the relic, well it’s nothing less than the Armour of Misery! While I said earlier that there are a lot of stratagems in this book, but part of that is due to the amount of distinct flavours of Drukhari you can have. The actual number of stratagems that I feel I will definitely be using is surprisingly low, just 4, all of them costing just 1CP each. Which is another reason for wondering whether I need to straightjacket my build into the Raiding Force in order to gain all the additional points! I’ve only scratched the surface of this book, it’s really blown me away with how immersive in Dark Eldar lore it goes. 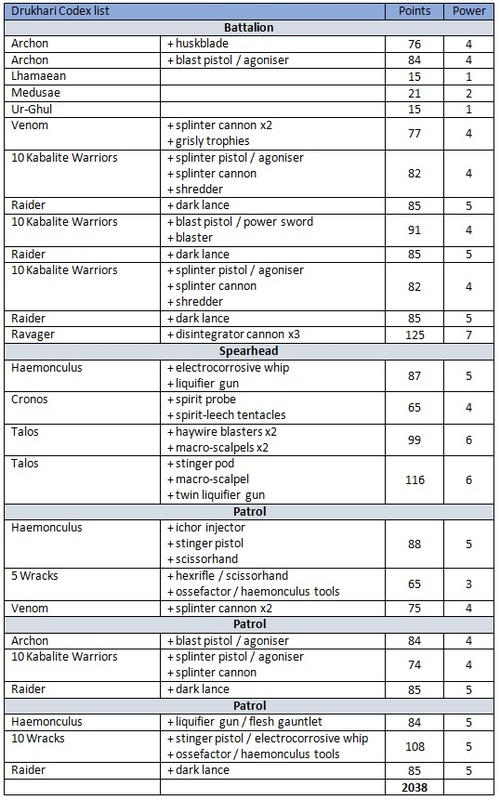 I’m not lamenting the loss of Trueborn or Archons with blasters, and will certainly not be delving back into the Index for those datasheets, as I think we have plenty of exciting material to be going along with right here. I’m eagerly awaiting my first game with the new Codex, after which I’m sure I’ll be coming back here with more practical thoughts on how it plays. For now, though, suffice it to say that I’m super excited at the fact my main army finally has its book! !